Employing the services of a healthcare billing company can increase patient collection rates, lower your cost of operations. For better or for worse, most medical insurance sold in the U.S. today includes high deductibles and copays, which means that patients bear a significant proportion of the expenses incurred on routine visits to the doctor’s office as well as for medical procedures. It also means that medical practices must have a robust patient collection strategy in place. After all, collecting payments from patients costs twice as much (sometimes even more) as it does to collect on claims from insurers. In the current scenario of ever changing guidelines for the healthcare sector and higher patient payment liabilities, here are nine ways to ensure that patient collections in your medical practice remain strong. An often-heard patient response is, “Sorry, I wasn’t aware that the cost of today’s appointment would apply to my deductible”. 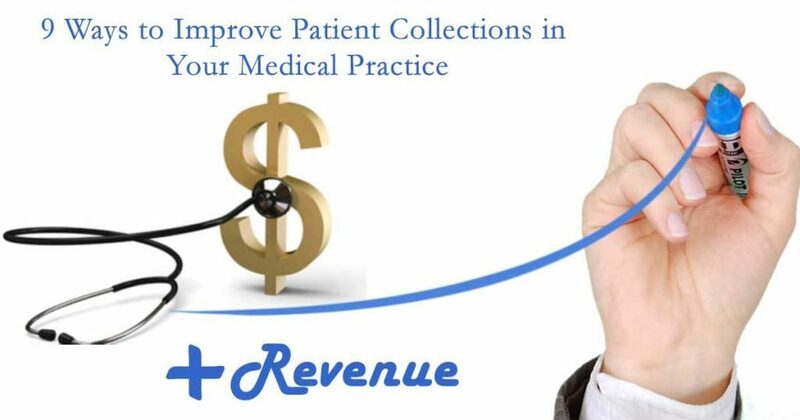 You can drastically reduce the chances of a patient coming to your medical practice unprepared by adopting a proactive payment collection strategy. First and foremost, use a software that gives you access to insurance eligibility of a patient at the time of service. Then, before the patient arrives at your office, ensure that they are informed about the copay and deductible due. Ensure that your staff also explains the available payment options on the same call. Make your payment policy transparent by sharing it with your patients. For instance, you could have signs in the waiting area that state your patient collection policy. You could also inform clients of your ‘no copay, no consultancy’ policy before their arrival so they come prepared. In addition to listing the costs of medical services and procedures, ensure that the patient statement has a clear description of the services performed, payer payments and adjustments, as well as the contact details of the staff they can call for further queries on the statement. Your front-end team should be well trained in using the in-house billing software to see the amounts due from patients and the available insurance coverage. Also, it’s vital that your staff remain polite and respectful in their dealings with patients. Providing them scripts for handling payment-related calls to patients can help. You can also do role-plays for training staff on handling financial conversations with patients. Collecting payments from patients is more difficult if you’re not using billing software. There are comprehensive practice management solutions available which besides giving real-time information on a patient’s insurance cover, can also be used to identify patients who are more likely to delay payments. You can use this information to tweak the collection strategy. For example, ask your staff to make reminder calls to these likely defaulters once a week, while for the rest of your patients, a reminder call and email once a month will suffice. You can improve your collection rate at the point of service by offering multiple payment options. Apart from the traditional methods of cash, checks, and debit cards, you can also explore the payment options of a credit card on file, smartphone apps, and through your website. Payment plans are for patients who would like to pay their medical bill in installments. You may want to have a selection criterion in place for offering this service to your clients, but the agreement must be documented in writing and signed by the patient. The payment plan should include a clause for what happens if the patient defaults, and should ideally not be for more than six months. Measuring the results of your collection efforts is essential. Meet with your billing staff once a month to discuss which methods are working and any challenges they faced during the month. You could launch an incentive plan to encourage staff to collect from overdue accounts which can often be an unpleasant task. Employing the services of a healthcare billing company can increase patient collection rates, lower your cost of operations, offer you greater control of the billing process, and improve patient satisfaction. Read more about the advantages of hiring a healthcare billing company in our post, ‘5 Fantastic Reasons to Hire an Offshore Medical Billing Company‘. With over 20 years of experience in High Risk Merchants eCommerce, card present and wireless point of sale, you are in safe hands with EthosPay Merchant Services. * We provide DOMESTIC based Credit Card Processing for Collection Agency Businesses! * Visa Mastercard Amex Discover Services for All Types of Collection Agencies. * Simple Payment Gateway Integration, Invoicing and Full Shopping Cart Integration. * Easy to Use Virtual Terminal. Fully Featured Payment Gateway Setup. * Mobile Swipe Credit Card Processing Available. * You will be Boarded with a Collection Agency Friendly Bank. No Fears about being closed, denied, shut off for your business type.